Help Scout integration allows you to bring chat, CRM, communication and e-commerce tools into one single platform. 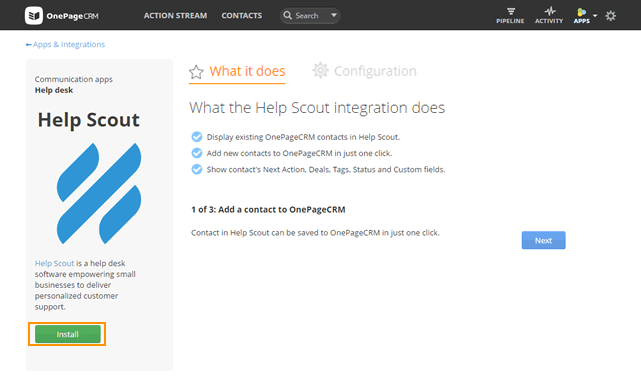 By installing Help Scout on your CRM details of your OnePageCRM contacts will be displayed in their Help Scout profile. 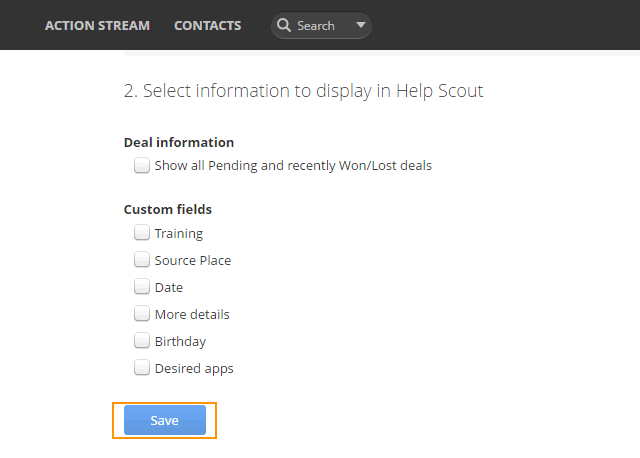 Go to Apps → All Integrations → click on the Help Scout logo under the Communications Apps category. Under the ' Connect Help Scout to OnePageCRM' section, copy URL and Secret Key. Log in to Help Scout, go to Manage → Apps → OnePageCRM app → Install App → Settings. 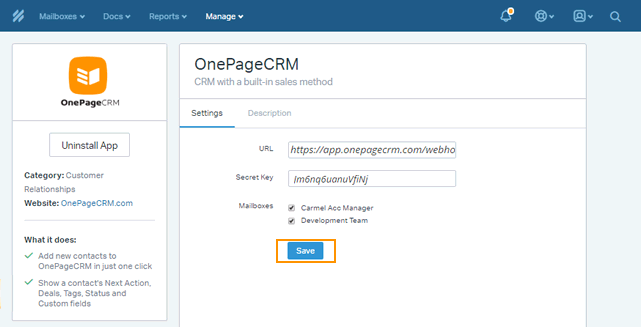 Paste OnePageCRM URL and Secret Key into the corresponding fields. Select Mailboxes to enable the integration for your desired company. Select Deal information check-box to show all Pending or recently Won/Lost deals from OnePageCRM in Help Scout. Select Custom fields to be displayed in Help Scout. Click Save to submit your preferences. To pin the Help Scout integration to the Apps menu, select the check-box: Pin to the Apps menu. Help Scout integration can be enabled and configured by the Account Owner or Administrator user only. 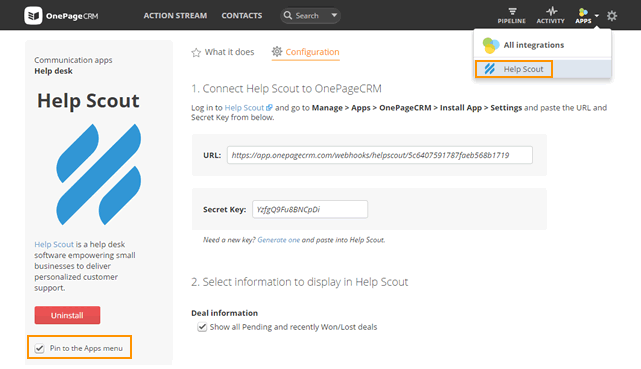 If a Help Scout contact does not exist in OnePageCRM it can be added in one click from Help Scout. View existing OnePageCRM contact details such as Next Action, tags, status, pending and recently Won/Lost Deals and custom fields.